Transcat offers industry-leading expertise in the repair of tools used during measurement and calibration tasks. With a dedication to outstanding service, we perform quality repairs for all types of instruments, including those featuring the latest industrial technology. Our goal is to restore your units to complete functionality through efficient procedures performed at a low cost. For more than 40 years, Transcat has offered superior instrument repair support, and our highly trained technicians have extensive experience servicing Meriam pressure instruments. You’ll find our advanced metrology expertise is available both in our repair centers and within our ISO 17025 Accredited Calibration Service labs. That means your Meriam process measurement instruments, manometers, and intelligent communicators will be repaired with rapid turnarounds and an unwavering commitment to customer care. Before you ever send in your unit, you’ll know if it qualifies for convenient Flat Rate Pricing. If an instrument cannot be repaired at a flat rate, we provide a quick estimate following a thorough evaluation. A Transcat repair service includes an accredited instrument calibration – with certificate – performed at the service level of your choice. 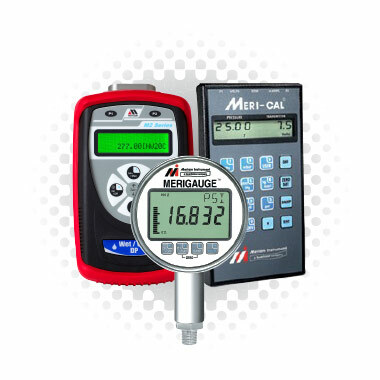 Several calibration levels are available to meet your quality requirements. Our efficient repair procedures frequently offer faster turnarounds than those provided by many original equipment manufacturers. The progress of our repair and calibration processes is easily tracked by using our metrology management software, CalTrak Online. Our repair expertise covers a wide range of manufacturers, including Fluke, Druck, Altek, Transmation, and more. View our repair service capabilities by instrument type or brand.